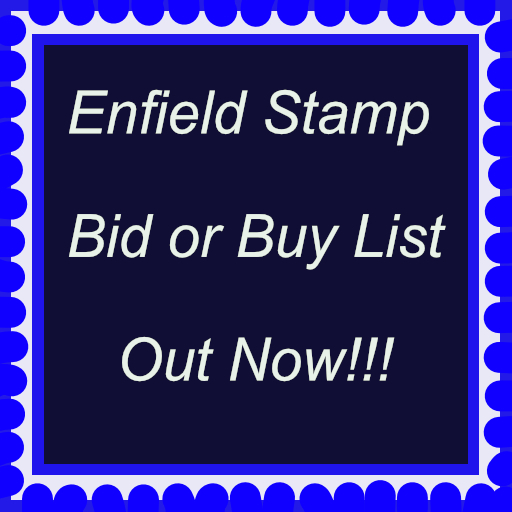 Enfield Stamp Bid or Buy List 450 - Enfield Stamp Company Ltd.
We have had a couple of Charity accumulations arrive in the shop recently. Gordon, who sorts out the one country selections, has really gone to town this time, and has produced a huge number of all periods stock cards full of stamps. I know how long it takes to put 100+ stamps on a stock sheet and so he must be congratulated for making so many lots for the charity and ultimately for us. Brian has finished listing Eric’s books. We are now researching suitable prices for them. Hopefully this project will be completed in the next couple of weeks. 3 Lunacy:1913 Certificate of Lunacy with Edw.VII Judicature 2s.,2d. 1875 Provincial Bank Certificate signed with a mark,unusual,good. diff.,& sold for £75,ord.1d.stationery envelope with 3 diff. 43 Defin.M.range to 50f.inc:better 20c.(SG.F30),25c.(SG.F32),50c. 203 Nature Of Australia pres.pack with 5c.,10c.,$2 & $5 Defins.,fine. 214 1840’s-1960’s M.& U.coll.on St.pages in no order with some dup. 216 1911-13 1d. Ovpt’d Levant,UM. (21)& M.vert.block of 24,(4×6),fine. 217 1937-1950’s M.& U.with some dup.on St.page,with vals.to 1r.,good. 218 1937-90’s M.& U.coll.Comm.& Defin.on album pages inc:1937 Ovpt. 233 G.V War Ovpts(6 diff. ),G.VI var.vals.to 1s.,1950 to 5s.,M.& U. 239 1937-1994 M.& U.coll.Comm.& Defin.on album pages inc:1938 3s.U. sheet,SG.151 & 152 bottom corner of 5 stamps around 4 labels, SG. nating strips in sheetlet of 16(Wmk.sideways),WWF.,U.,very fine. printed album,fairly complete for period,very fine. (889+19 bklt. 262 All periods to 1940’s M.& U.coll.on St.pages inc:1924-25 5f.M. 267 1916-39 Comprehensive M.& U.coll.on leaves inc:1916-17 to 5Fr. 268 1960’s-80’s M.& U.coll.on Hagner inc:1964 Olympics MS.M.(SG.MS. 50c.,75c.& 1f.M. (SG.11-13 C.£170),25c.U.,1912 Ovpt.range to 10c. 272 & Benin:Coll.early Tablet issues inc:Golfe de Benin range to 75c. 25c.,U.,then 1912 Surch.ranges,high cat.,minor dup.,fair to good. C.£90),then complete from 1937 1c. (SG.34)to 1939 Revolution 2f. 281 1928 FLOOD Relief Air set,M.,on page,fine. (10) Not Cat.by SG. 1891-1900 M.range to 25c.& 50c. (SG.7 & 8 C.£157),U.range to 20c. 283 1914-17 Red Cross issues,mainly M.(1 U. )range on pages comp.SG. 59,60(2 x bl.4)62(M.& U),Tangier SG.63,64(2),65(2),good to fine. French P.O.’s,1914 to 50c.,later Defins.& Airs,1938 OSE Surch. some Dues,1915 to 5Fr.,1923 Surch.to 3Fr.,20Fr.(U. ),1923 to 1Fr. range to 1f.,2f.& 5f.M. (SG.D79-81 C.£150),1919 Due Surch.range M. 40c.,50c.(2),1Fr.,2Fr. (2)& 1912 05 on 15(U. ),05 on 20c.& 30c. 5Fr. (SG.16 C.£60,gum adhesions),1937 Int.Ex.set & MS.UM.(SG.C. 302 1896-97 P.Dues(M.3,U.2),1908-17 to 5Fr. (4),1922 New Cols.to 1Fr. 10Fr.& 20Fr. (M.& U. )Airs M.to 50Fr.with 1Fr.75c. (C.£140)& 20Fr. range General issues Ovpt.5c.R.inc:5c.on 30c.Type D M.(SG.5 C.
coll.on leaves,Comms.& Defins.,Airs,many sets,etc.,mostly fine. order & needs sorting,few Alaouites & Alexandrette,fair to good. 316 1925-30 M.& U.coll.on leaves inc:1925 Ovpts.to 25p.,1925(Mar.)2p. 322 1901-1960’s M.& U.coll.on St.pages inc:1901-3 Dues ranges to 1f. 325 1920 to about 1970 M.& U.coll.on St.page inc.1928-21 range to 5f. M.(toned gum),later material in.1964 Olympic set & MS.UM.(SG.C. 328 P.Dues:1918 set to 50c. (with add.10c.M. )& 1918 Recouvrements 1c. 330 1905-16 Germania 20Pf.& 15Pf.M.on written up page with both vals. Derby(2),1934 2Mk.,3Mk.,Airs(C.£95),etc.,fair to fine.High Cat. 1949 Cycling,Goether,Hanover Ex set & MS.etc.,good to fine – Cat. – Pfalz & Wurttemberg complete,also a few minor varieties & U. 339 Mainly pre 1970 U.range on St.page,inc:1951 Humanitarian 30Pf. Rontgen,Schurz,etc.,also a few Berlin,fair to fine.High Cat.val. 341 1972-77 UM.& CTO.U. (one of each set UM.& U. )Comms.& Defins.coll. 342 1940-41 Views set fine U.on page(30g.reddish-violet Unused),SG. (6),white paper(9)1858-59 1d.plates(12),2d. (8),& 1841 2d.Imperf. 357 2d.Stars:Nine U.examples,they all look large Crown,Perf.14,good. heads Imperf.to Perf.,1896 Olympic set U.to 1d. (No 40L.)(SG.C. pictures,covers & cards,ideal for Thematic collector.(187+97cvrs. 391 1911 Sigurdsson set U.on page,also extra 4a.& 15a.,good to fine. 396 1938-45 U.coll.on pages inc:1938-47 Geyser set complete inc:Perf. 407 1938-45 M.coll.on pages inc:1938 Independence set,1939-45 Defin. 25a.scarlet both Perfs. (SG.250 & 250a C.£96)etc.,good to fine. 409 1920-30 Officials M.& U.coll.on page inc:set M.(SG.C.£180),U. 418 1907-08 Two Kings M.coll.of Defin.& Officials btwn.SG.81 & SG. 3a.,better than average condition for this issue,good to fine. 423 1922-35 M.& U.coll.on pages inc:1925 Views set M.(toned gum)& U.
C.£183),various Officials Ovpts.inc:1936 50a.block of four U.(SG. 430 Officials:1930-49 M.range on card,inc.1936-49 range to 8a,good. Official 3p.on 1a.8p.M.block of four(SG.O58 C.£52),fair to good. 435 Persia:1911-39 small,predom U.,range on leaves inc:1911 var.vals. Postes Iran Ovpts.,1to to 3to(C.£82.75),1935 var.vals.to 5r.(C. 441 Earlies to c.1970 predom U.range on St.page inc:1951 MILAN 55L. 442 1870-1958 M.& U.coll.,neatly mounted on leaves,inc:1912-20 to 6d. 1960 Defin.set to 10r. (No 3L. ),mixture of Air Mail & Registered. 454 All periods,predom U.,few M.,range on St.page,inc:1858-62 4d.(SG. 458 Early to about 1930’s,few later,M.& U.coll.with minor dup.on St.
page,inc:1885 1c.& 2c.M.& 25c.U. (SG.1,2 & 6 C.£208),(also 75c.M. 463 1870’s-1960’s M.& U.coll.with dup.on Hagner & pages inc:many QV. 1960 Health sheets U. (SG.MS.804b C.£38),many Pictorial Defins. 465 All periods M.& U.random ranges on St.page & leaves,for sorting. broad date order with some sets inc.1977 Inca Runner set M.(SG. 472 1943 1st Agri.Science Congress,UM.corner bl.of four,fine. (8) STC. 498 1953-72 M.& U.coll.on St.pages with some Comm.sets,also Defin. (togetherness)Stamps,10 of each,Setennant,The Polar Express,fine. 506 1937-51 M.(1937 Coro.set U. )coll.on album pages inc:1942 set M.
Unissued Service M.(SG.O6-O9),other issues range to 12a.M.& 6a. 511 1900-49 M.& U.coll.on album pages inc:1927-30 1s.vert.pair U.(SG. 517 1897-1954 somewhat dup.,M.& U.range on Hagner leaves inc:Ovpts. 522 1960 Defin.set to 2Fr. (No Granite issues)with 5c.,10c.,20c.,50c. 524 1949 UPU.set in UM.blocks of four,some age tone spotting,good. 544 1909-60 M.& U.coll.on leaves inc:1913-23 to 1s.,War Tax Ovpts. 550 M.& U.,mainly modern,coll.on leaves & loose,inc:1898-1902 8a. (M.